Application deployment is becoming an increasingly hard task, as complex, component-based Grid applications have to be deployed on heterogeneous and dynamic Grids, interfacing to several different component frameworks and Grid middlewares. We describe the architecture of the Grid Execution Agent (GEA), the deployment and resource brokering tool of the Grid.it project. GEA has been designed to ease the deployment of complex Grid applications written in a high-level, structured way. To easily handle different component models over heterogeneous Grid resources, the GEA design exploits multiple levels of abstraction. Our approach allows consistent translation of the high-level requirements from heterogeneous, multi-component applications, to low-level operations over different middlewares. GEA architecture provides a unified interface with services to locate resources, devise initial mapping, and instantiate applications, and it is extensible to new component models. It supports dynamically reconfiguring, self-adapting applications by allowing execution-time resource allocation changes. This work has been supported by: the Italian MIUR FIRB Grid.it project, No. 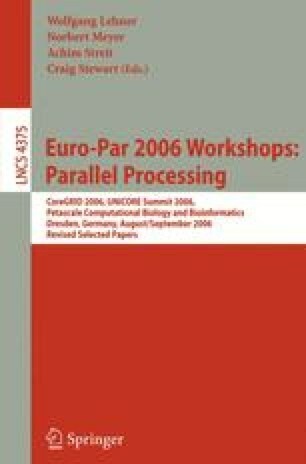 RBNE01KNFP, on High-performance Grid platforms and tools, and the European CoreGRID NoE (European Research Network on Foundations, Software Infrastructures and Applications for Large Scale, Distributed, GRID and Peer-to-Peer Technologies, contract no. IST-2002-004265).